Jaume Masia (Bester Capital Dubai) has won his first ever Moto3™ race after taking a sensational win at the Gran Premio Motul de la República Argentina, the Spaniard holding off Darryn Binder (CIP Green Power) and maiden podium position finisher Tony Arbolino (VNE Snipers) as the lightweight class treated us to yet another unbelievable race long scrap. 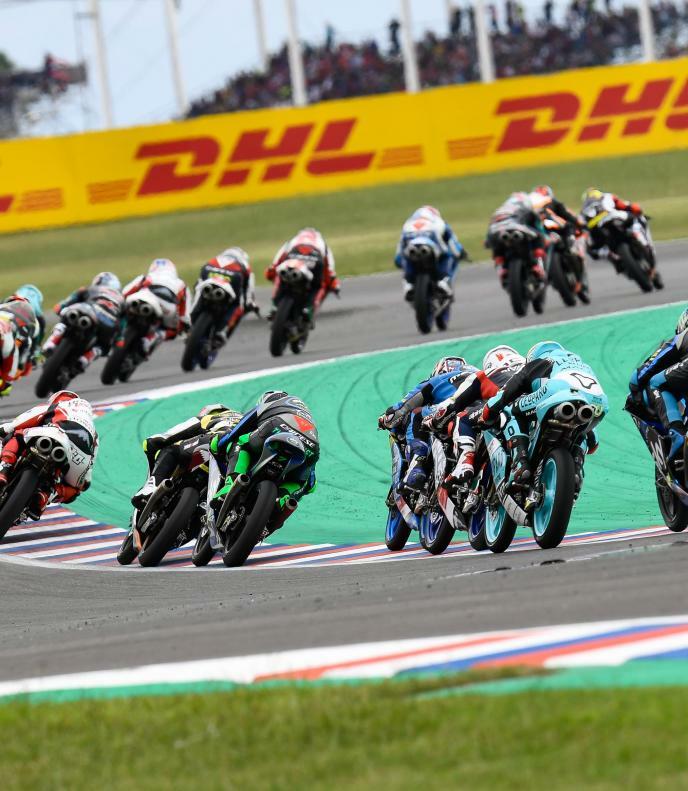 Pole man and eventual race winner Masia messed up his launch as second on the grid Aron Canet (Sterilgarda Max Racing Team) got the holeshot, with Arbolino having a shocker off the line to slip outside the top ten. But it was Canet who remained at the front as Niccolo Antonelli (SIC58 Squadra Corse) made a good start to slot into second ahead of Masia, as Canet and the Italian exchanged positions at the front on the opening couple of laps. 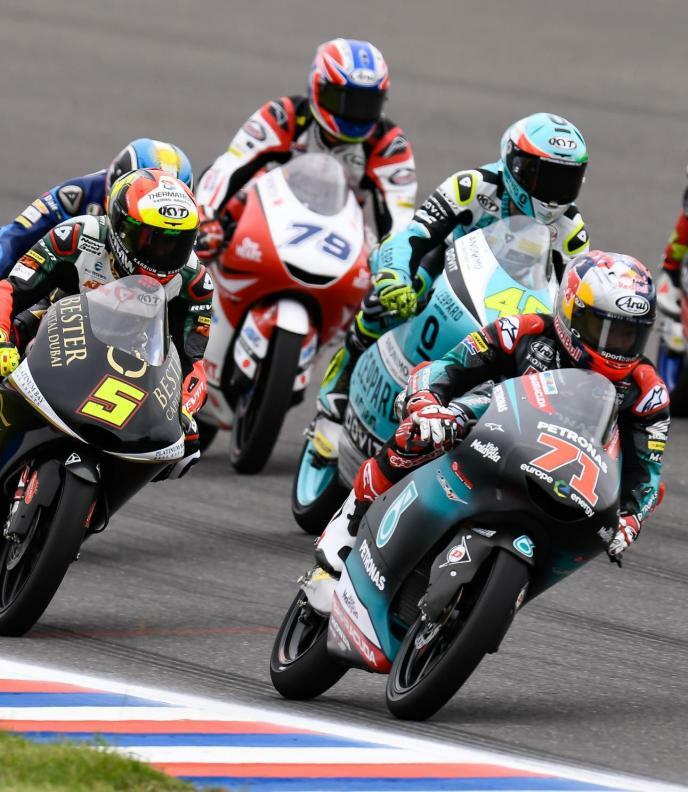 In typical Moto3™ fashion, the top 19 were covered by just 2.1 seconds as home hero Gabriel Rodrigo (Kömmerling Gresini Moto3) and Free Practice’s quickest man John McPhee (Petronas Sprinta Racing) started making moves from outside the top ten to pick up the baton at the front – the crowd going wild for Rodrigo. Another man to make moves from the rear end of the field was Binder as the battle at the front raged, with the race seeing nine different leaders in the first 12 laps of the race. 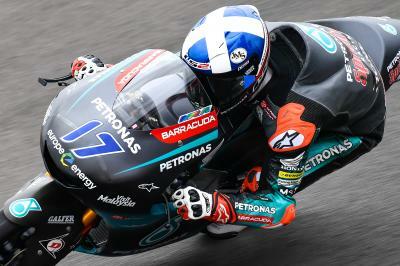 McPhee and Alonso Lopez (Estrella Galicia 0,0) then crashed out of winning contention with nine laps to go at Turn 13, the Scotsman running in too hot and clipping the back of the Spaniard’s Honda after his rear brake had broken moments before. Back at the front and Dennis Foggia (SKY Racing Team VR46) had now taken over at the front, but Canet, Binder and Rodrigo were the top three over the line with seven to go. With five laps remaining, 1.7 seconds covered the top 17, with less than a second covering the top 14 in a race that really was anyone’s to claim at this point. 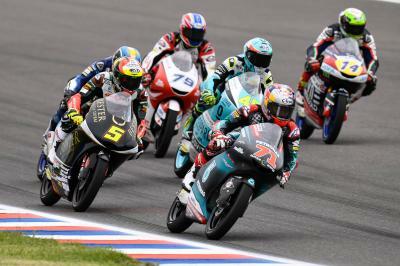 Binder and Dalla Porta were at the forefront with Rodrigo right there on home territory and heading onto the last lap, it was Dalla Porta moving underneath Binder at Turn 1 to take the lead. But at Turn 5, Binder got revenge. However, slight contact between the two meant Dalla Porta ran wide as Rodrigo used the slipstream to grab P1, Masia slotted into P2. The Spaniard held it during sector three and heading down into the tricky Turn 13, Masia, Rodrigo, Binder and Arbolino were searching for the best line, but there was small drama for Rodrigo as he nearly crashed after tagging the rear wheel of Binder. 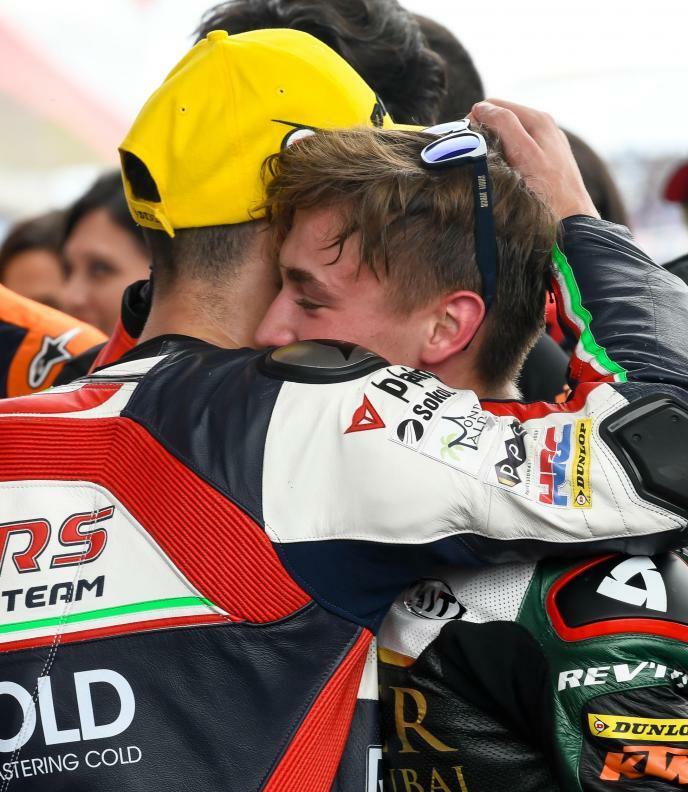 This allowed Arbolino to go through as Masia held P1 to claim his first Grand Prix win, Binder grabbed a sensational second with Arbolino securing his maiden podium in P3. 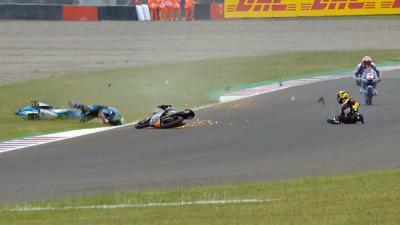 Redox PrüstelGP teamates Filip Salac and Jakub Kornfeil crashed at Turn 13, both of whom were able to rejoin. 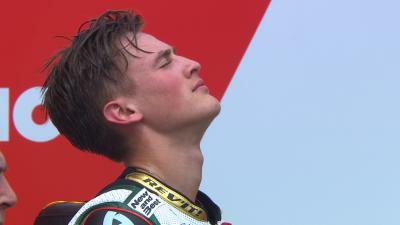 Another breathless Moto3™ race sees Toba continue to lead the Championship ahead of Dalla Porta, with Masia jumping up 26 places to third in the title race following his victory.